Sustainability at Manila Water | Manila Water Company, Inc.
Sustainability has long been in Manila Water’s DNA, integrated in our business and embedded in our day to day work, it is a dynamic approach beyond brand reputation and beyond profits. The company treats sustainability as a paradigm to ensure continuity and enhance growth as it creates shared value for and with our stakeholders. In 2006, Manila Water with the assistance of the International Finance Corporation (IFC) a Sustainability Policy was developed to guide the company’s sustainability track. Over the years, several changes in the organization and business environment prompted the company to revisit the policy and identify the gaps that need to be addressed. Click here to download a copy of Manila Water’s Sustainability Policy. Manila Water identified five focus areas of the core business wherein the social and environmental goals are aligned with the business goals of the company, resulting to shared value delivered at scale. The sustainability framework operates from the inside-out, beginning with caring for and developing our employees who are at the forefront of the company’s work. 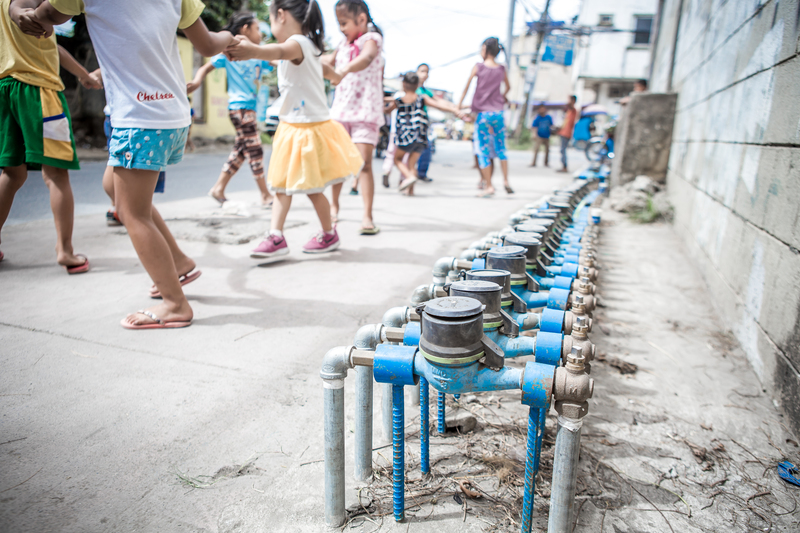 Through our water service that provides access to potable water and sanitation facilities, Manila Water helps build communities and protect the environment, also realizing that the business depends on a secure water supply, we seek to nurture our environment in all phases of our operations. 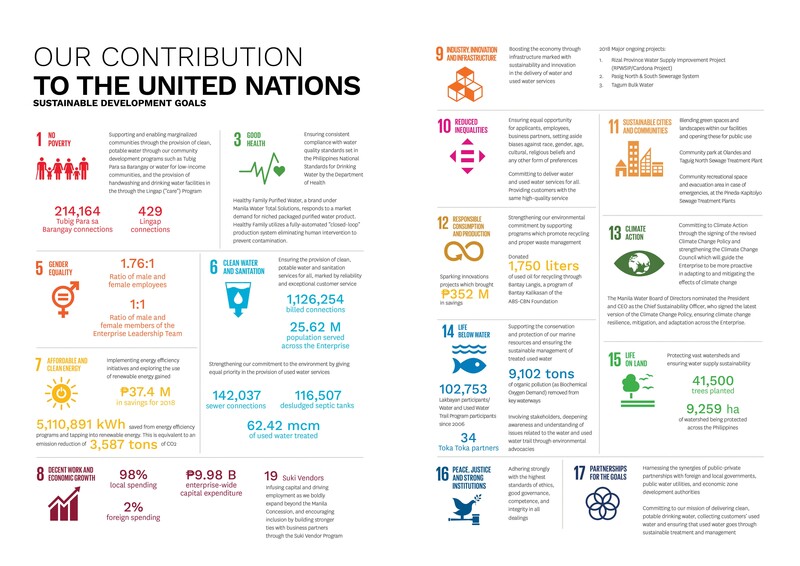 As a pioneering private sector partner in nation-building, the Ayala group has embraced the SDGs as the backbone of its sustainability framework, manifested by aligning its investments and sustainability commitments with the seventeen global goals, in partnership with engaged stakeholders. Manila Water has been challenged to at least one of the SDGs as a key focus area. In the course of delivering clean water and sanitation services to its customers, Manila Water’s main contribution to the Ayala sustainability goals is attending to the targets of SDG No. 6 – Clean Water and Sanitation for all. In 2007, Manila Water became the first company in the Philippines to have a formal, Board-ratified Climate Change Policy. The company’s Climate Change Policy predates the national climate change policy, including the Philippine Climate Change Act, the National Framework Strategy on Climate Change and the National Climate Change Action Plan, which were approved in July 2009, April 2010 and August 2011, respectively. To better align its Climate Change Policy with the government’s anchor strategy of adaptation, Manila Water revised its policy in 2013 to prioritize initiatives in enhancing climate resilience of assets and operations rather than minimizing carbon footprint due to the country’s vulnerability to climate change patterns. The Policy was revised in 2019 to reflect commitments on the proactive water source development and expand climate change mitigation programs to include initiatives other than energy efficiency and renewable energy. Click here to download a copy of Manila Water’s Climate Change Policy.